In Nigeria, Distraught Parents Demand Answers After Boko Haram Kidnaps 110 Girls : Parallels Boko Haram insurgents seized the girls from school last month. The kidnapping mirrors the mass abduction of Chibok schoolgirls in 2014. "I want to die, because I'm missing my daughter," a mother says. 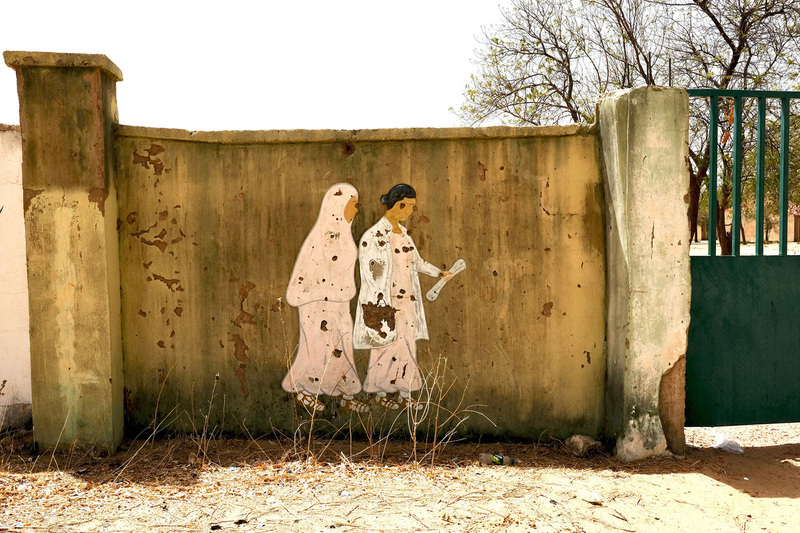 A mural showing a teacher leading a young girl to school is riddled with bullet holes after an attack by Boko Haram militants last month. They attacked the Dapchi Government Girls Science and Technology College in northeast Nigeria. These were clearly not random shots, because many other murals decorating the same wall remain untouched. The message in the bullet-pocked image is unmistakable – that girls must not go to school because "Western education is haram" or sinful, a rough translation of Boko Haram's name and its oft-repeated mantra. The terror network operating mainly in Nigeria's northeast has targeted both boys' and girls' schools before, with its most high-profile mass kidnapping taking place in 2014 — the abduction of nearly 300 schoolgirls from Chibok. "We are against Boko Haram," says Alhaji Kachalla Yoroma, the emir or traditional district head and religious leader in the village of Dapchi. "Islam means peace. We are living for peace. Abducting children and killing innocent people and burning houses – this is haram [sinful]. What they do is haram." Alhaji Kachalla Yoroma, the emir or traditional district head and religious leader in the village of Dapchi, is resplendent in regal robes and a maroon cap with a blue tassel. He's carrying Muslim prayer beads, intermittently working them with his fingers and praying, even as he responds to questions. "They say Boko Haram. But 'boko' [education] is not 'haram' [forbidden] for us, because we are all now enjoying Western education. We are against Boko Haram," he says. "Islam means peace. We are living for peace. Abducting children and killing innocent people and burning houses – this is haram. What they do is haram." The Dapchi abduction mirrors the modus operandi of Boko Haram in Chibok four years ago. The attackers arrived in pickup trucks under cover of darkness, wearing military uniforms and firing guns, pretending to be Nigerian soldiers and taking the schoolgirls into their confidence, then herding them onto vehicles and carrying them away. However, on the night of Feb. 19, some girls at the Dapchi school were suspicious of the telltale signs — some men were wearing open-toed rubber flip-flops and turbans and purported to have come to "rescue" them. None of these actions are compatible with Nigeria's military. Hundreds of girls, and some of their teachers, ran away, abandoning their footwear, leaving it strewn all over the sandy grounds of the school's sprawling campus. They scaled a perimeter wall and escaped into the bush or hunted for sanctuary closer to home. The rest were not so lucky. Dapchi is arid and dusty, with mud-brick homes and cement-built houses, and is a predominantly Muslim town. 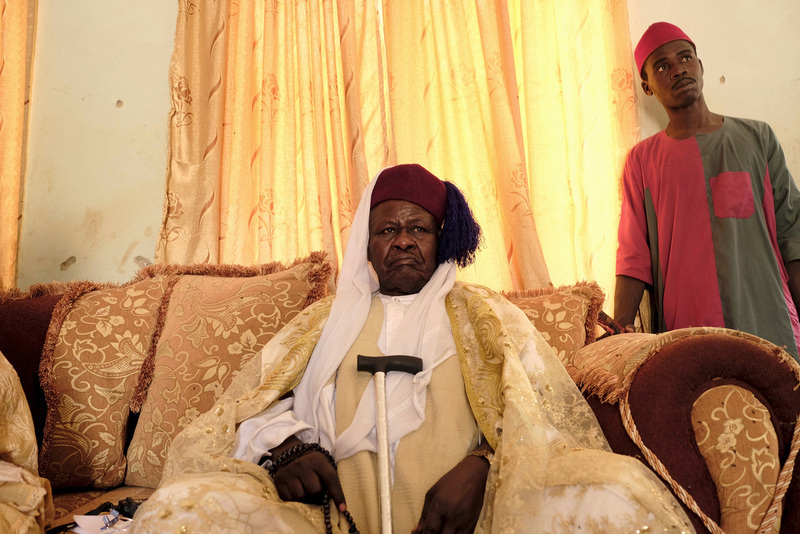 The emir's son, Gani Ibrahim Kachalla, took us round the school, and showed us the dormitories where he says many girls had begun their ablutions for evening prayers at the mosque when the insurgents struck that fateful Monday night. "Boko Haram came here. They started shooting guns," he says, adding for emphasis "shooting gun, shooting gun, shooting gun." "The Boko Haram claimed they were soldiers," he says. "They just deceived the schoolgirls." Kachalla says, as well as outside the dorms, gunmen opened fire in other parts of Dapchi, probably to keep parents and family members away while the mass kidnapping was taking place. It's hauntingly quiet at the school now, without the chatter and laughter of 900 girls. One hundred and ten girls were carted off in vehicles by their kidnappers and have not been seen since that night. Their families are frantic, desperate and heartbroken. 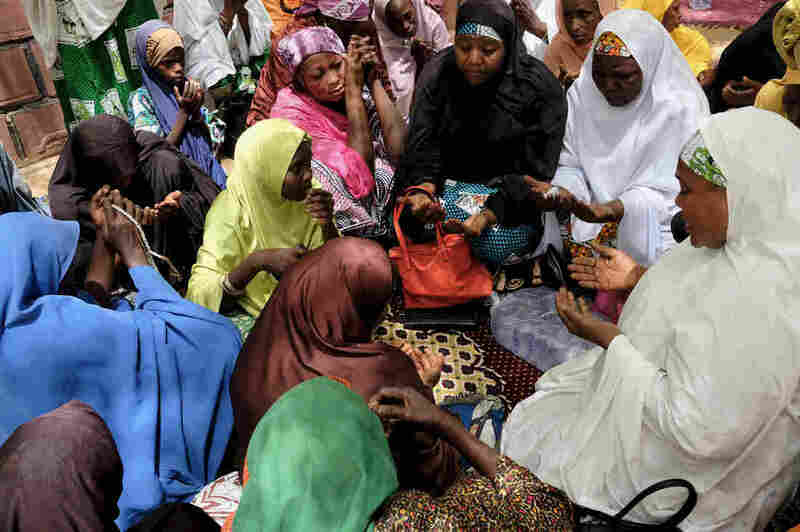 Rebecca Sharibu is among the distraught parents sitting on mats under a shade tree outside the emir's palace, down the road from the girls' school. On the morning of Feb. 20, says Sharibu, parents went to the school and found some of the girls emerging from their hideouts. Her 15-year-old daughter Leah Sharibu was not among them. Speaking pidgin English, Sharibu says: "They say, 'Now Boko Haram don come. They don pick them now and go with them.' We see some of the girls coming. We say, 'Where are our children, the girls?'" Sharibu's eyes are red with constant weeping as she relives her daughter's ordeal — and the parents' nightmare. "Even die, Ma, I want am," she says in pidgin. "Yes, Ma. I want to die, because I'm missing my daughter Leah Sharibu." Describing Leah, Sharibu says proudly: "She is a good girl-o. She is a good girl. She likes school." Then, sorrowfully: "I never sleep, I never eat." Her message to Nigerian President Muhammadu Buhari is to "please bring back our girls," echoing the hashtag of the campaign launched after the Chibok mass kidnapping in 2014. Sharibu feels the Nigerian authorities have failed the families and must protect schoolchildren in Dapchi and all over the country's northeast. That's where Boko Haram has mainly waged war on the military and the government – and targeted civilians for the past nine years. Almost 2 million people have been displaced during the insurgency, which has killed more than 20,000 people. Thousands more girls, boys, women and men have been abducted by Boko Haram over the years. One faction has pledged allegiance to ISIS and another to al-Qaida. The Buhari administration is accused of mishandling the Dapchi crisis – just as the previous government was blamed for bungling and mismanaging the Chibok girls debacle — with a confused and incoherent initial response. Buhari campaigned for the presidency in 2015 on a platform of subduing Boko Haram and finding the missing Chibok schoolgirls who'd been abducted the previous year. But Nigerians were aghast last month when an early, mistaken report came out claiming that the Dapchi girls had been rescued by the military. "Déjà vu," they said, remembering similar incorrect reports about sightings of the Chibok girls after they were abducted. More than 100 of the Chibok girls remain unaccounted for, almost four years after they disappeared. There was an unseemly and public war of words between the military and police about who should have been manning checkpoints and guarding the school at the time of the Dapchi kidnapping, with each blaming the other. Buhari has now increased the military presence around schools in the northeast and has deployed reconnaissance aircraft to help search for the missing Dapchi girls. But families say those efforts are simply not enough. Kachallah Bukar is secretary of Dapchi's Abducted Girls' Parents' Association, a support and solidarity group that has emerged since the latest kidnapping. His 14-year-old daughter Aisha is one of the 110 girls kidnapped. He can barely control his wrath. "If there had been enough security, this will not be happened," he says, adding that he will not be sending any of his other daughters back to the government college and will find a new school for them to attend where there's "proper security." Then Bukar becomes melancholy: "I am totally confused. I cannot sleep, I cannot eat well. I cannot even perform my prayers well," he says. "We the parents are now seriously disturbed. Some are mentally affected. My wives are crying and shouting – and in her dreams, [Aisha's] mother wakes up and starts calling out, 'Aisha! Aisha!'" Dismissing this journalist's question about whether he has a message for his daughter, there's desperation in the father's response. "Can you deliver the message to her?" he asks. Told that it would be broadcast in a radio report, he responds testily: "Do they have radios where the abducted girls are?" He says all he wants is to see his daughter back with his own eyes, so that she can continue her education. "They are the future generation. I want all the missing girls to come back and further their education — but not in Dapchi girls school again. God help us." Bukar says President Buhari must act now. "Up to now, we don't have any proper action taken by the government," he laments. "Only one committee sent by Mr. President visited Dapchi. Those girls have spent 18 days with those militants of Boko Haram in the bush. The girls are all underage. There's even a disabled girl among them. She cannot even move properly. The government should assist us to bring back our girls. It's the government's responsibility to go and bring them back to us." Bring them back, say the Dapchi parents — dead or alive. Nigeria's president and military have repeatedly claimed Boko Haram is "technically defeated." However, security experts say a faction of the terror network is working to professionalize its kidnapping operation. They warn this mass abduction of Dapchi schoolgirls — who they now believe may have been whisked across Nigeria's border to Cameroon — might be a taste of things to come.